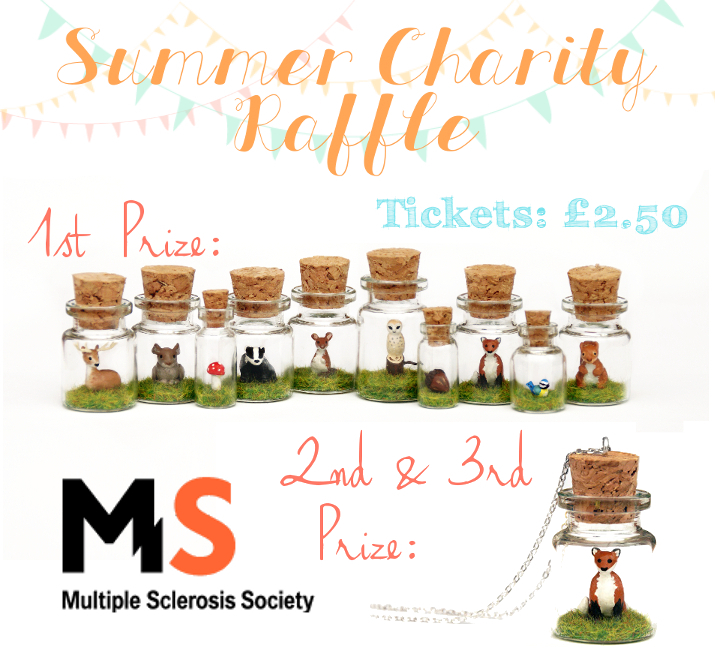 Yup, my raffle to raise money for the Multiple Sclerosis Society is open for just one more week! So if you've not bought your tickets already, you've got until Saturday 1st August to do so! They're available worldwide, so anyone can purchase them; each ticket also comes with a free digital watercolour print of either a fox, badger or rabbit - the choice is yours! You can find the tickets and their corresponding prints in my Etsy shop and here on the blog! Three winners will be announced and contacted on Tuesday, August 4th, first prize being a 10-piece woodland miniature jar bundle - either as necklaces or just ornaments - worth £250 if purchased individually - and two runners up will receive one of the new fox jar necklaces! If you don't win, however, I created a second 10-piece bundle which is available in the shop for £200, so it's still discounted by £50, and the proceeds of that will also go to the Multiple Sclerosis Society. Remember, you have until Saturday to purchase your tickets, and the more you buy, the more chances you have to win the grand prize! And you can read about my experience with my mum's Multiple Sclerosis right here, too!